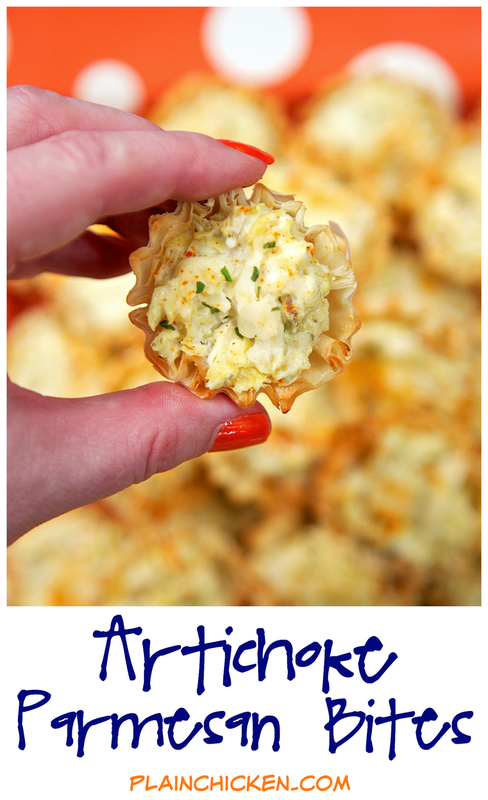 Artichoke Parmesan Bites - only 5 ingredients! Can make ahead of time and refrigerate or freeze for later. Great for parties! We could not stop eating these. YUM! Happy New Year everybody!! I can't believe it is 2016! We spent NYE watching the college football playoffs. We made mostly party/tailgating food for dinner. 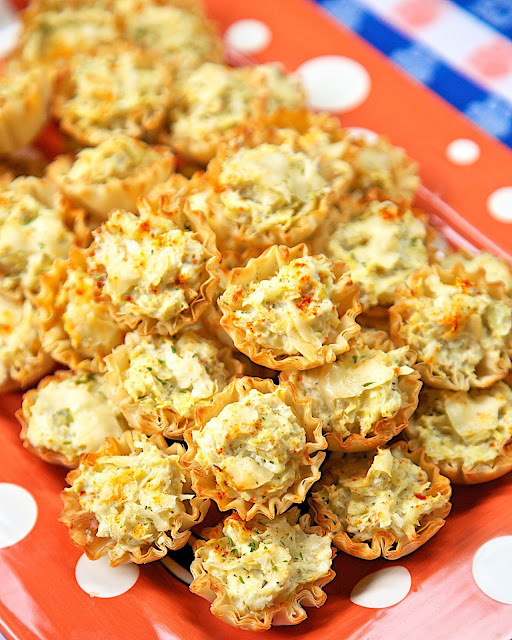 These Artichoke Parmesan Bites were one of our favorites. They only have 5 ingredients and are super easy to make. We could not stop eating these, they were so good! The best part is that you can make these ahead of time and refrigerate or freeze for later. Perfect party food! 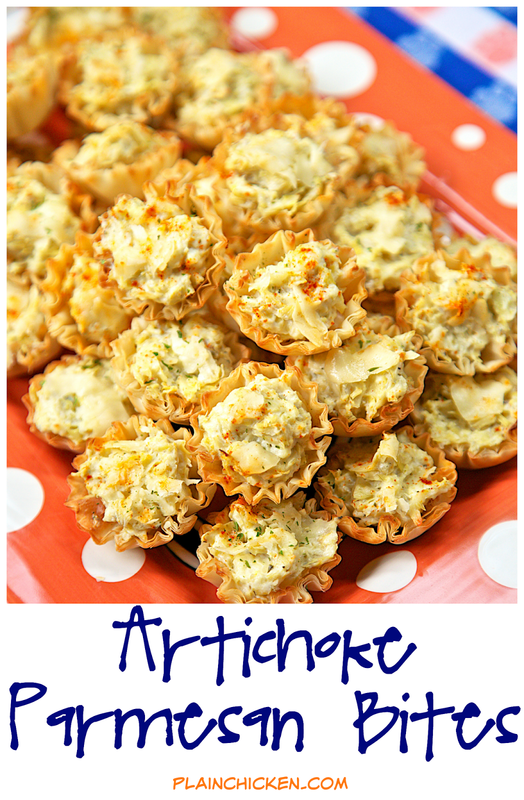 Place artichokes in food processor. Pulse 4 times, until artichokes are finely chopped. Add parmesan cheese, garlic salt and cream cheese. Pulse 2 or 3 times, until combined. 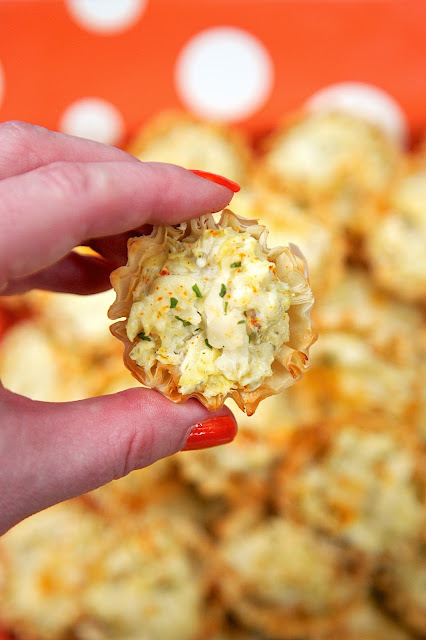 Scoop into phyllo shells. Bake for 15 to 20 minutes, until heated through. Can you give a few more details on how you prepare them before and after freezing? I'm always looking for great make-ahead recipes. If you want to freeze them, assemble them and put them in the freezer unbaked. You can either thaw them or add a few minutes to the baking time when you cook them. is there paprika and parsley on them? I see fleck of red and green but not sure what they are from.. ty! Does cooking them frozen change the flakiness of the phyllo dough? The directions say nothing about how to do the phyllo she'll?? Do you use mini muffin tins or regular size muffin tins? How do you get the pleated look? The phyllo shells come like this out of the box. Just bake the filled tarts on a pan. I am also interested in your answer - Can I cook after frozen and then can they be eaten cold.